When Terysa, one of our GOC participants, sent me a link to her site, I fell in love with her fabulous twist out! She used a TnC technique and placement that I’ve never seen before and I immediately asked if I could re-post it on Hairscapades! She graciously obliged! So, without further ado (I love to say that, don’t I? ;), here is our first GOC Guest Feature! Soooooo I’ve been trying to get my twist out ‘right’ for over a year!! Can you believe it??? Well, I tried again last weekend and it worked … correction, semi worked :-). I will definitely try it again to make sure it wasn’t a fluke. 1. I separated my hair into 4 (2 in the front, two in the back). 2. I then detangled each section and parted and flat twisted 3 smaller sections. 3. Allowed to dry about 85% and added Cantu Shea Butter for shine. 4. Carefully undid each twist and let alone, I fluffed on the second day – WAY WAY HUGE!! Lasted for 3 days out and an additional 4 days for a huge bun! Picture overload below, kinda got camera happy. Have you ever done a Pineapple Twist Out? If so, how did it work out? If not, would you try it? Very pretty. I love the fluffiness and shine. ABSOLUTELY STUNNING!!!!! I will be trying it myself this weekend! Thank you, I would LOVE to know how it turns out. I have never done this but I will give it a try. Like you I must let it dry 100% for it to turn out great. Me too, and I’d also use something to hold it a little better. Because it didn’t last long. Terysa, have you tried the ORS Twist and Lock Gel? 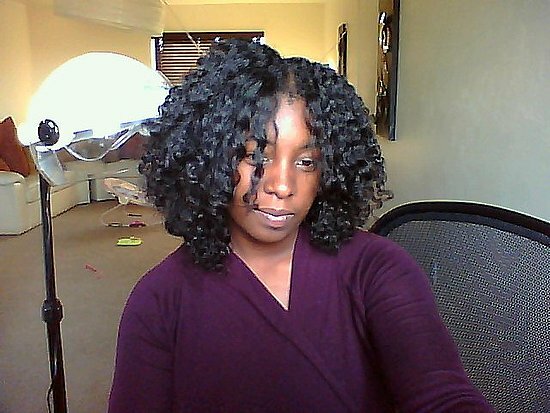 A lot of people seem to get great hold with it (have you seen KaiRox’s flexi rod set that she did with it? If not, go to the Video category under Style Library and you’ll find her youtube video. FABU!!!). I bought the stuff because of her, but have only used it to smooth my edges so far. So, not sure how it will work for me on a TnC yet. When I try it, I’ll give everyone a review! Very nice. I saw it on your blog when you first posted it and thought I’d try it one day. I pulled all of it up into a high ponytail and slept on a satin pillowcase. Aren’t they?!?! When I realized I could use different avatars for people without pics, the lil’ monsters were a no brainer! They crack me up! LOL!! if only i could flat twist. lol I’m gonna have to try this. Very pretty!!! It wasn’t hard at all, that was my first try 🙂 Thanks!!! I love this. I have to agree that taking them out damp gives a more natural curl pattern. I like to do this on twist outs and it eliminates single strand knots. I Love it!! !It’s so pretty. But what makes it a “pineapple” ? I think it’s just the way that it looks when set because of the parting on the head Tia;). This is very pretty, I need to start practicing doing flat twist on my own head! !